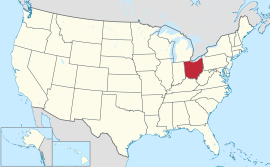 ↑ According to the U.S. Census July 2007 Annual Estimate, Greater Cleveland is the largest Metropolitan Statistical Area (MSA) that is entirely within Ohio, with a population of 2,096,471; and Greater Cincinnati is the largest MSA that is at least partially within Ohio, with a a population of 2,133,678, approximately 25% of which is in Indiana or Kentucky. Which MSA is the largest in Ohio depends on the context. ↑ Hershey, William (November 8, 2006). "Strickland becomes first Dem governor since '91". Middletown Journal. Retrieved 2009-03-25. ↑ "About Lee". Office of the Governor. 2009. Retrieved 2009-03-25. ↑ "Democrats Jennifer Brunner, Lee Fisher to run for U.S. Senate". Associated Press. February 17, 2009. Retrieved 2009-03-27. ↑ 15.0 15.1 "Sherrod Brown". Washington Post. Retrieved 2009-03-27. ↑ "Official USPS Abbreviations". United States Postal Service. 1998. Retrieved 2009-03-26.